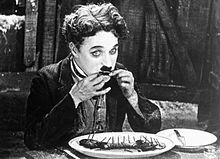 ↑ "Charlie Chaplin Dead at 88; Made the Film an Art Form. "۔ نیو یارک ٹائمز۔ مورخہ 6 جنوری 2019 کو اصل سے آرکائیو شدہ۔ اخذ شدہ بتاریخ 2007-08-21۔ Charlie Chaplin, the poignant little tramp with the cane and comic walk who almost single-handedly elevated the novelty entertainment medium of motion pictures into art, died peacefully yesterday at his home in Switzerland. 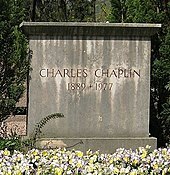 He was 88 years old.